A ‘second time lucky’ dog, I’ve sussed over the years, is one who, You line up for a true blind, quite possibly on a fairly tricky angle, or with temptation elsewhere. Your body shape is good. The dog is straight. He has clearly been, however *you* choose do so, told ‘no’ to any distraction or previous line taken. He seems locked on to the correct line. You send him… and he flys off line almost immediately. Of course none of us particularly care in training. Training is training and if it went right all the time it wouldn’t be training but showboating at the things we are good at so don’t need to be training on – grin. But in a competition it turns a beautiful 20/A retrieve into a novicey looking messy fight within the first 20 yards, as of course you can’t call the dog back and start again I thought the LAST 20 yards of a 150 yards retrieve were meant to be the hard ones… but no, its more often the FIRST 20 yards on some occasions I defy anyone to say this does not haunt them too sometimes…. SOOOO many dogs do this that I was pondering the reasons. I do think they vary from dog to dog, but whatever the reason its a fustrating syndrome. The second time lucky dog! Do some dogs just get into the habit of believing their OWN convictions on a line FIRST, before happily being called up, and *that* telling them ‘you are wrong, wipe that from your mind, use my line’ so they DO? I’m fairly sure that is the case with Fish. He isn’t a dog to ‘pull you around’ so when he stamps off on a line, he genuinely is convinced its the right one I’m pretty sure. Yet the second time takes MY line, that line which I gave him the first time, with pace and conviction and heart… and you are just left standing baffled! I’m not one for always calling my dog back if the line isn’t quite what I wanted. Don’t think that, because as I’ve been clearly shown that can create a horribly sticky dog with little pace on the first 30 yards, but I do find the ‘syndrome’ very interesting as you see it in punchy dogs. Sloppy steady eddies. Trotters. 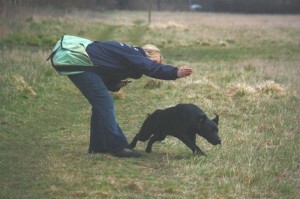 Speed machines and dogs that at no other part of the retrieve would DREAM of ‘playing you’. And of course they can’t be ‘playing you’ really as dogs don’t work like that mentally….. or DO they? Deep phycho assessments/sob stories/shared musings of the ‘Second Time Lucky’ dog warmly welcomed.